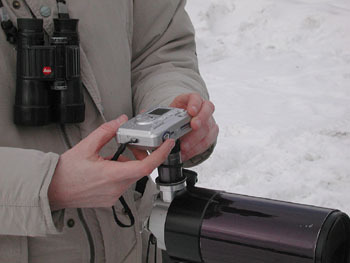 Digiscoping - The practice of using a digital camera with a telescope for magnification. 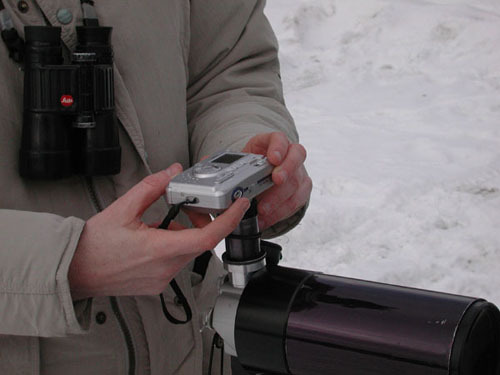 In March, 2003, I bought a Fujifilm A303 digital camera to use with my Questar telescope for photographing birds and other wildlife. The Fujifilm A303 is basically a point-and-shoot camera that doesn't have many bells and whistles, which is just as well - the less time I have to futz with the camera's settings the more time I can concentrate on taking pictures. Besides, the camera does a reasonably good job of automatically adjusting the Fstop, shutter speed, and other settings. The most popular camera that birdwatchers use for digiscoping is one of the Nikon Coolpix models. I decided against buying a Coolpix because of the cost and the fact that it's a big, bulky camera that almost requires an adapter to use with a telescope. By comparison, the Fujifilm A303 is small and using it with my Questar is fairly straightforward and easy: I center and focus the subject in my scope and hold the camera up to the eyepiece and shoot. Unfortunately the resulting images aren't always stellar so an image editing program such as Photoshop is necessary to make corrections. The main problem I have with using the camera with my Questar is that there's a perceptible delay between depressing the shutter and recording the image, a problem that doesn't occur with SLRs or high-end digital cameras. This delay is most noticeable (and most annoying) when a bird moves out of view just before the image is recorded. Another problem is that the autofocus on the camera sometimes gets confused about what exactly to focus on. This happens, for example, when I'm trying to photograph a bird in a tree and there are branches between the camera and bird. The resulting image has the bird slightly out of focus but the branches in focus. Finally, photographing flying birds is almost impossible - it's simply too hard to follow a flying bird with the scope and hold the camera at the same time. Despite the shortcomings, I've had good results (and good luck) photographing birds and insects with this camera/scope arrangement. Most of the photos on the Photo Gallery pages and all of the photos on the Iceland Gull Photos page were taken with my Questar and a Fujifilm camera. My Fujifilm A303 digital camera died in July, 2007. In August I purchased a Fujifilm A610 digital camera, which is similar to the A303 but has more megapixels (6.3 versus 3.2) and a larger LCD. In November, 2007 I lost my A610 and I bought a Fujifilm A820 to replace it. Hopefully I won't lose this one.